Long-distance relationships require a lot of patience and love. This is what I tell myself every time John flies back to the States. It is hard and I feel pretty much like Demeter who has to let Persephone head back to Hades. Well California is not exactly Hades, but I hope to have conveyed the message. I am ready to keep myself as busy as I can till next summer. It won't be hard this year. I am currently managing Pandemonium (aka as my translation agency) all by myself since the month of September. It is hard and engaging, but a beautiful endeavor as always. I am also resuming my work on the WIPs. And, getting ready for more reading too. 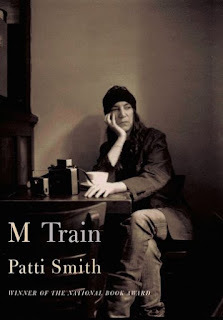 I have a pile of TBR books and two brand new additions I bought in the past few days that I simply cannot wait to read: Toni Morrison's latest novel, God Help the Child, and Patti Smith's M-Train.